Something a bit different this month … we decided to buy a kit, just add an egg and see how different th e experiences of the three of us Foodie Challenge(d!) Feasters turned out to be. 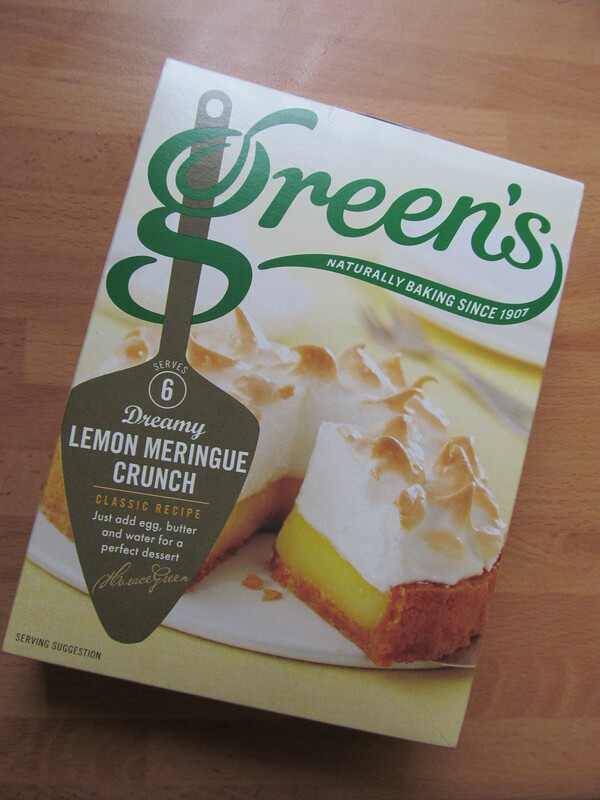 We decided on a Green’s Dreamy Lemon Meringue Crunch kit which Frances had tried before, but Linda and I had never attempted. I think the choice of kit to use was probably my fault as I’d said I’d like to try to make a meringue for the egg challenge but had never made one before. I must have looked at a particularly complicated recipe which described the process as taking 2 days (yes, honestly) and decided I couldn’t possibly commit to that (dahhhhling). 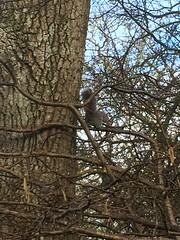 This seemed a quicker and easier way to tackle the challenge, just to see how I got on and whether I could find another, none 2 day taking, recipe some time in the future. 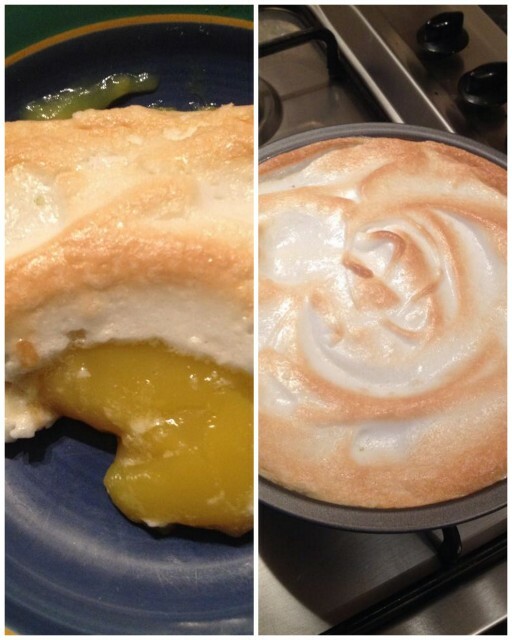 To be honest, I’d only ever eaten lemon meringue once before too (I know, shockingly deprived!). It’s not that flat Frances! So, Frances tackled the challenge first and said the results were very well received by the family who declared it to be delicious. 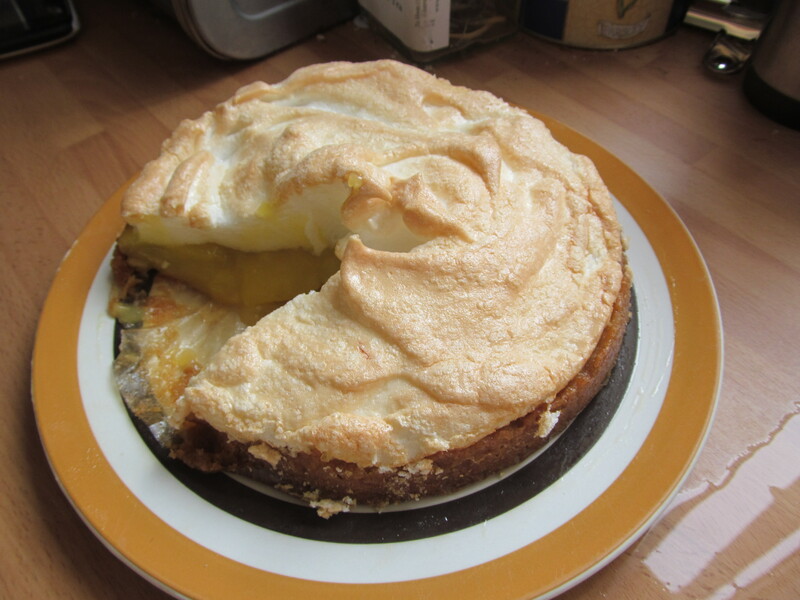 She did also say she thinks she should have beaten the meringue for longer as it was a bit flat and frothy – but it looks great to me! Linda went second and wasn’t too impressed with the lack of satisfaction she gained from the whole experience. 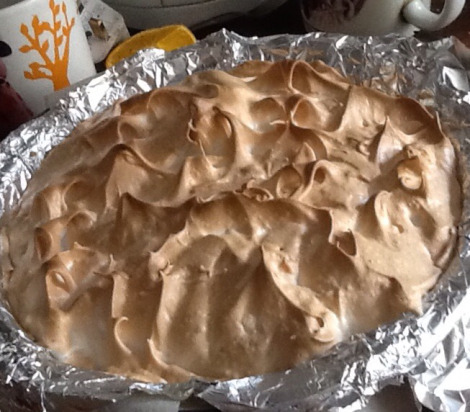 Her meringue looks great and you can see what she thinks on her blog. 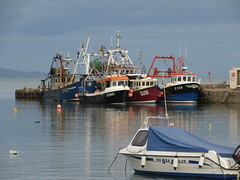 As for me, well, I’m blaming the equipment!! What should have been a really simple, quick and tasty task turned out to be a bit of a nightmare when my greaseproof paper decided to take my meringue captive and refuse to release my soggy biscuit base! I can only conclude that my measuring of the butter which was added to the crunchy base was wrong. I used old fashioned dial scales rather than electronic and think, given that this was my second baking balls-up of the week, it’s time I joined this century and got myself a new set of scales. Having said that, I did enjoy cooking the meringue, won’t be as scared to have a go at the real thing in the future, have bought another cake kit (red velvet cake) to stick in the store cupboard for “emergencies” and will be using a kit for next month’s flour bake too! Greaseproof gripped soggy biscuit base! Quite interesting that we had 3 such different results from 3 identical kits.